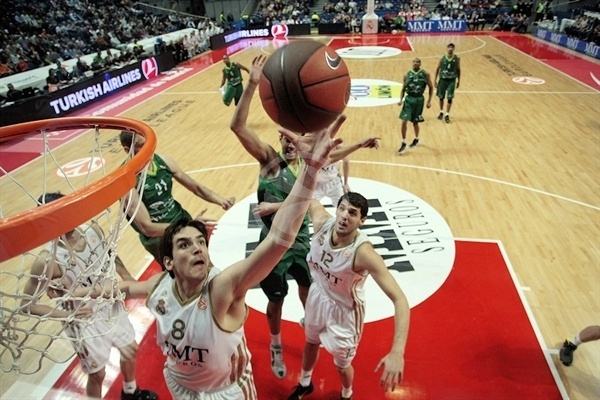 Real Madrid managed to stay alive in the Top 16 thanks to a 86-65 home win over Unicaja on Thursday night. Unicaja started like a hurricane with a 3-14 burst, but little by little, the hosts managed to climb back from the well and prevail at the end. With the win, Real Madrid improves to 3-2 and ties for second place with Gescrap BB. The two Playoff berths from this group will be decided in the final week as the three teams still have options to advance. Unicaja, winless with a 0-5, is out of the race. Nikola Mirotic led the winners with his 18 points including 4 of 9 threes, Sergio llull added 15 and Jaycee Carroll posted 13. For Unicaja, Gerald Fitch nailed 15 points, Augusto Lima posted 12 and Hrvoje Peric contributed 11. The game started with Sergio Llull blasting a clean three for a 3-0 Real Madrid edge. 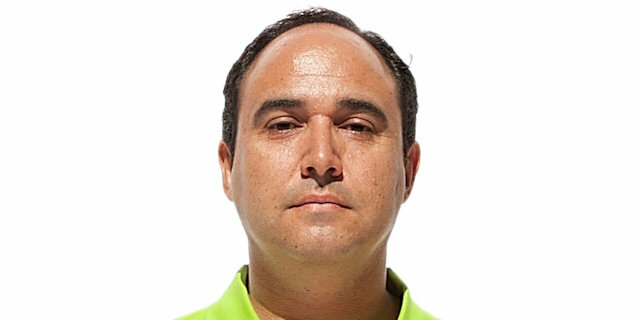 However, out of the blue, Augusto Lima sparked waht would become a 0-14 run. With threes by Gerald Fitch and EJ Rowland, and contribution from Tremmell Darden, Unicaja managed to run and climb to a 3-14 forcing the timeout of the hosts. 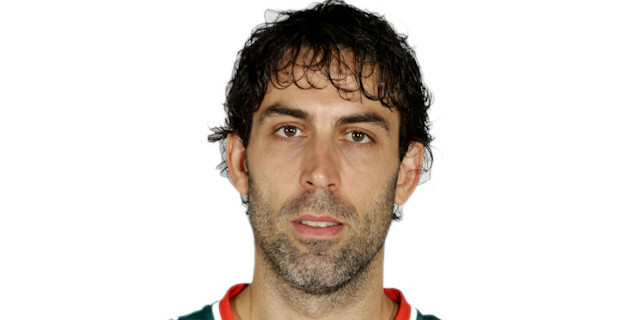 Unicaja insisted on the zone defense but Real Madrid started scoring again with Felipe Reyes' jumper and then Llull added a three-point play for a quick 10-16. The guests managed to pick up a little more steam by the end as Rowland and Hrvoje Peric scored to put an end to the first period with a 14-22 Unicaja lead. 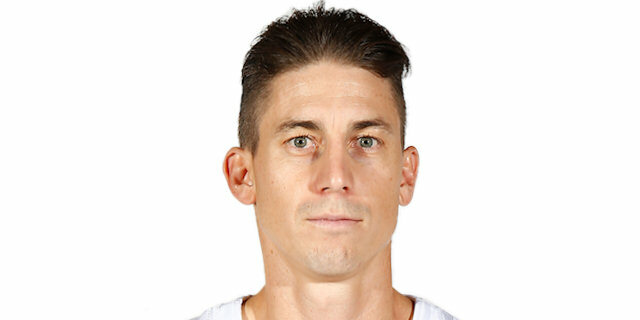 In the second quarter Jaycee Carroll took the game by storm as he scored the first six points of the hosts in the quarter to make it 20-26. 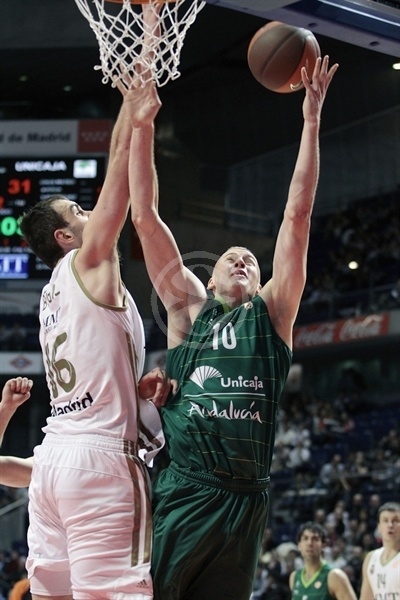 Hrvoje Peric was also on fire for Unicaja and he kept the guests at a safe distance. Trying the zone that had been so useful up to that point, Unicaja managed to go back into double digits with a Berni Rodriguez layup, However, Real Madrid reacted fast from 27-37 with a 7-0 capped by Nikola Mirotic's three for 34-37 forcing a new Unicaja timeout. 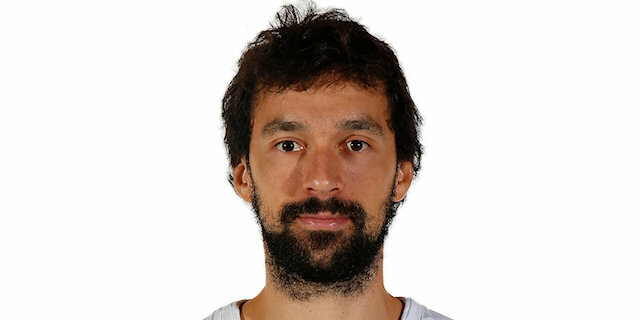 Mirotic was now launching Madrid and made the scoring run escalate to 14-4 with his third straight three to put an end to the fist half with the first tie of the game, 31-31, at the break. Fitch opened the second half with a three in transition to keep Unicaja ahead a little longer, but the hosts appeared again with a new 7-0 run sparked by Carlos Suarez's three. Novica Velickovic tipped in for the first Real Madrid lead since the first basket, 46-44, and then Ante Tomic sealed the burst. Fitch ran to score again, and Lima appeared with four straight points including a scoop shot to make it 52-50, but Llull put the guests back to the ground with a new three. The pace was fast on both ends, but Madrid was finding better options in offense and drew fouls to convert from the line and make it 59-53. 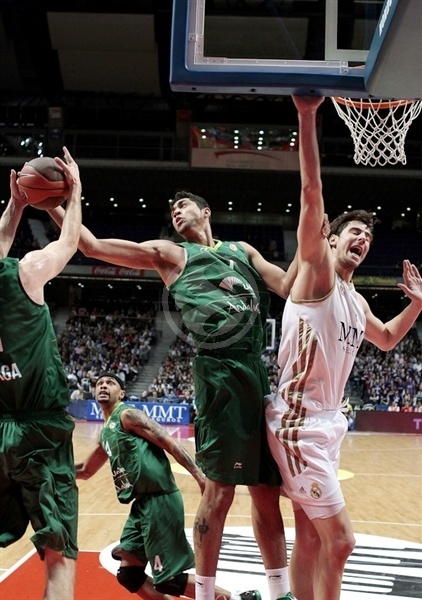 Unicaja was having a hard time from the charity stripe making it the score difference at this point. Despite a few more plays, the ball didn't go in anymore and after 30 minutes the score was 59-53. In the first two plays of the last quarter, Real Madrid made it a double-digit lead, 63-53, after Marty Pocius' free throws. Carroll and Peric traded dunks but the hosts were controlling the tempo at ease now. Time was running and thanks to offensive rebounds, Real Madrid was getting second options in offense. On the other end, Unicaja had a problem with turnovers, as they prevented the guests from completing the plays that would allow them to climb back. On the other side, Carroll hit a new bomb form the arc to start sealing the deal and Llull soon joined in with his three-point play to make it 74-59 with 3:45 to go. The 13 offensive rebounds of Real Madrid combined with the 17 turnovers of Unicaja at this point, were a clear mark of what had happened in the last three quarters. When Mirotic hit a new three for 81-65 entering the last minute, Real Madrid escaped with the win and set a thrilling stage for the Top 16 Week 6. "It is a win to stay alive. At the start of thegame we were not physically in the arena. Fortunately, we recovered and managed to play more comfortable in the second half. 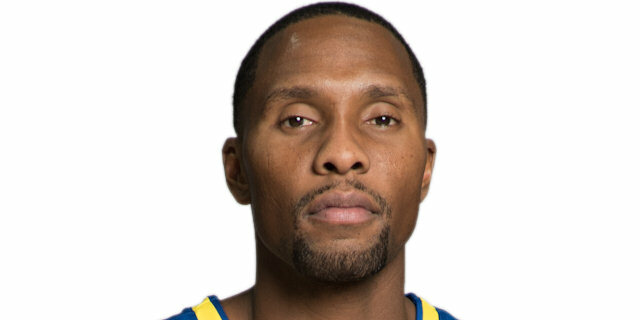 We have to go to Siena like this was a final, but they are favorite in this game." "The game was too long for us. We were in the game for a long time, we were even ahead. But we gave too many chances to a team with resources to use them. They had a lot of rebounds. I think we are not the judges of this group. We will play against Gescrapp BB next week with total respect for our jobs and trying to get a win." "The team was tired and a little bit unfocused because of external factors: winning the Spanish King's Cup and yesterday's win of Bilbao over Siena. That shocked us. We started badly but we recovered with intensity. First we have to think about a win in Siena next week and, if we can, go for thepoint differential. It won't be easy." "After the weekend we had we started too soft. But we managed to find our pace and do things as we like. Winning big in Siena is a difficult feat, but I have seen many things in basketball. First, we will have to focus on the win. 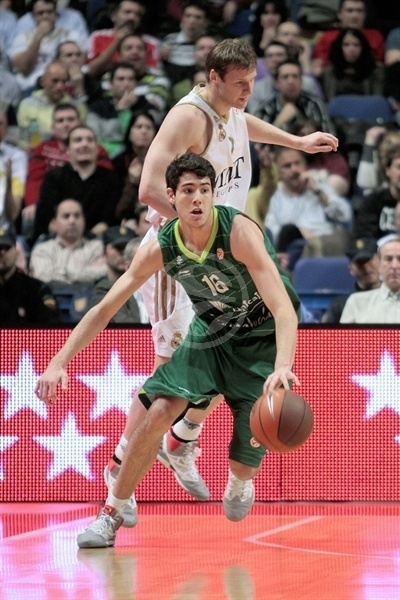 Then, we have to hope for a little luck and Unicaja maybe beats Gescrap BB. They are a good team with pride." "We did fine for about 35 minutes. We knew we were out but we came out focused. We played with intensity. The team is getting better and that is the most important thing now. Next week we will do everything in our hands to finish with at least one win." "We lost to a great team. I think they were a bit out of it at the beginning because they come from a busy weekend, but they hang in there and then Mirotic killed us with the open threes. For the next game we want to finish the Top 16 with at least a win."